When you send an email directly from your inbox, the only field you edit is the subject line. However, when subscribers views the email in inbox they see three components: “From” which is your name, the subject line, and the preheader (in the event there is none, this field would display a preview of the first line of text within the email). As mobile opens statistics increase, we also have to consider mobile view which is slightly different. Depending on the device, recipients may see anywhere from 30 to 60 characters of the subject plus additional wrapped preheader text. The overall view and the coherence of the three components are deciding factors for whether they click to open or not. Your goal is to leverage the character space for both subject and preview text to it’s highest potential to maximize the open rate, which will be one your main campaign success metrics. Without going into discussion on what flags emails as spam (you can always revisit it here), let’s take a look at what makes a subject line clickable and how to stand out amid the clutter of a typical modern-day inbox. Adding in the numbers—“the 5 best…” or “10 tips on…”— multiplies the benefit effect. It shows that you’ve done the work for the reader and are providing them with a curated list of “the best of the best”. The number directly correlates to the value, so you have to make sure that it’s not too high or too low within the context of the benefit. The recipient’s name in the subject line can establish a personal connection between the sender and recipient and can boost open rates. Still, this tactic is overused and savvy readers are no longer falling for the trick. Personalization is not limited to addressing recipients by name, however. When done on a more sophisticated level it can take open rates through the roof. When certain data is not available and you are operating on assumptions about the recipient, it’s best to keep the targeting narrow. Avoid catch phrases, like in the notorious Google ad “Every owner of a PC should have this game”. Umm, ok Google, I don’t own a PC and I am not even into gaming. Perhaps the most trivial of all are the seasonal subject lines, or subject lines that leverage current and topical events for relevant messaging. These are not only fun to write but also fun to click on. The tough part is, once again, breaking through the clutter of hundreds of “12 days of Christmas” and “Be my valentine” messages. It might be worth spicing up the pitch with some puns and emojis. While benefit subject lines are straightforward with their content, mystery subject lines make a play on the human nature of curiosity. These subject lines are the opposite of direct but no less compelling or successful. The last one with its creep factor (which takes a humorous turn when “we” is revealed to be wall decor) is from Social Print Studio, a hipster print company from San Francisco that has hacked the subject line game with its “out of the box shock value” approach. or will be reassured that nothing fishy is going on only by opening the email. Where there is a problem, there is a solution. The question subject line is designed to identify a pain point and provide an answer to it within the content of the email. The key is to identify what are the main problems recipients may be faced with and how your content, product, or service addresses that issue. Ready to reel in a deal on some wheels? If your ESP doesn’t have a form field for the preheader, then the email appears in the recipient’s inbox with a trailing line of text after the subject line. This can get ugly if not curated; best case scenario, it’s your headline, but most likely it’s “view online” or worse, depending on how messy your HTML code is. Some of us may not even realize the power of this small mishap. Essentially, you miss out on the opportunity to maximize the potential of that preview text, or worse, you are confusing the reader with strange characters appearing in the preview triggering them to unsubscribe. There is a scrappy way to deal with the preheader by making sure that the first line of text provides a snapshot of the email. The issue with this is that the preheader copy ends up as part of the email content once it’s opened. This could take away from the design flown and clutter your super succinct headline or greeting. Not ideal. 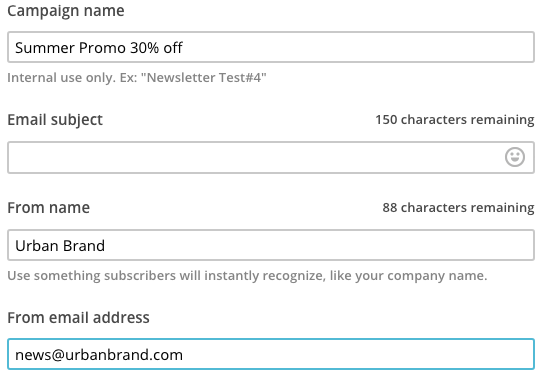 Many companies use this method, even though the text sits right above the email shell header and precedes the brand logo. Aesthetically, not the best option. There is another option that doesn’t require any manual coding. 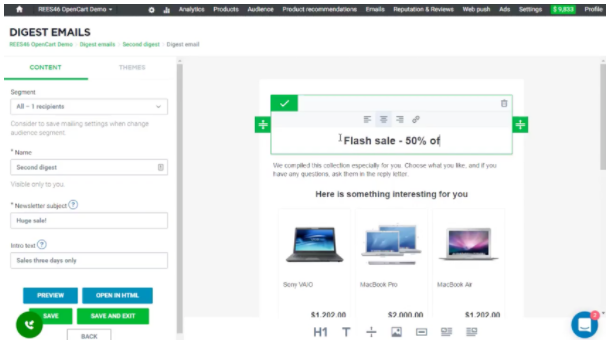 The REES46 visual email creator and editor can be launched directly from your store and has a special form field for preheader. All you have to do is simply add the text to the form field and you are good to go. Preheader’s main purpose is to enhance the subject line or serve as the secondary subject line. For example, if the subject line is a question, the preheader should be the answer. If it’s a survey, the subject line can be a call to action, while the preheader can be the reward. If there is a mystery offer and a secondary offer, the latter goes into the preheader. 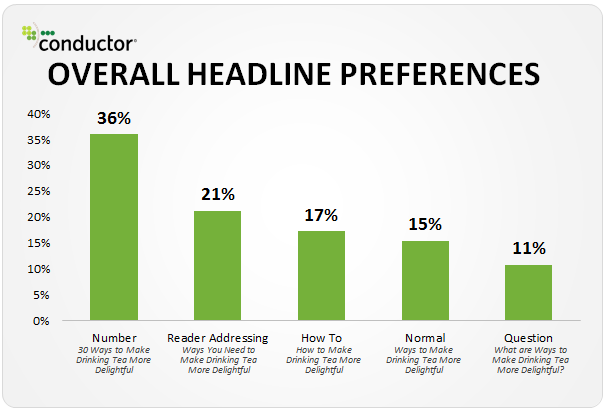 Similarly, the newsletter can highlight primary content in the subject line and secondary content in the preheader. 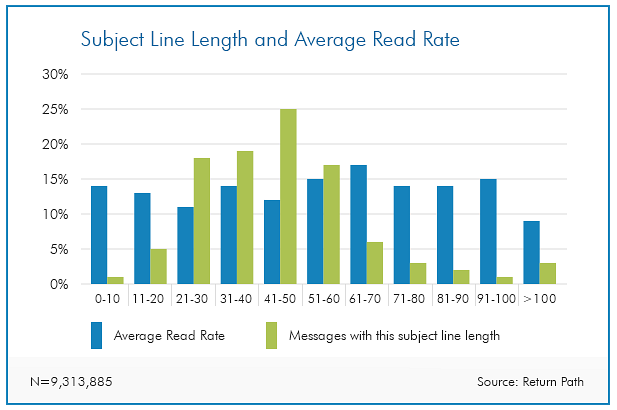 As email marketers, we lean towards making subject lines short and sweet. However, business and revenue goals may necessitate marketing a complex offer that is hard to fit within 50-70 characters, let alone 30-40 characters (if viewing on mobile devices). So the question arises: does size matter? There are different schools of thought on the subject. 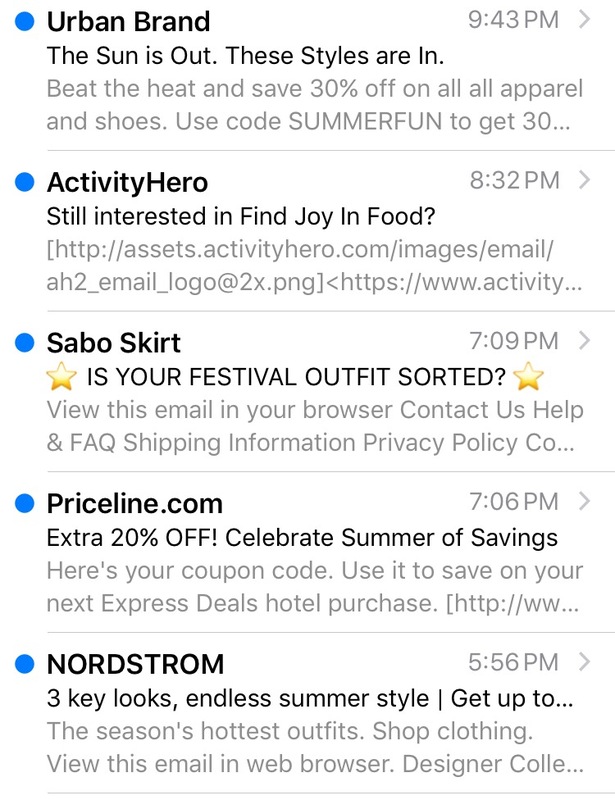 Logically speaking, if there is a part of the subject line that is not visible in the inbox preview, it doesn’t have any bearing on the open rate and subsequently on the conversion rate. A research study conducted by MailerMailer in 2012, the early mobile days, when most companies had very little targeting strategy, concludes that out of 1.2 billion emails, readers opened emails most frequently with a subject line length of 4-15 characters. The number of opens dropped significantly after 51 characters. A similar research project conducted by Return Path just a couple of years, in 2015, later demonstrates a different dynamic. The general rule of thumb in email marketing is that if something is true today, it is likely to change as soon as a new generation of devices appear on the market. Mobile technology and Big Data have changed the way emails are created and the way they are processed. Much of the data available on the subject today is either outdated or not statistically significant. The only way to understand how readers engage with subject lines for a certain industry, product and season, is through testing. We test because we know that not all client databases are created equal. We know that individual habits may change over time as technology and people change. We know that open rates are not standard across the board or not even within a particular industry. So the way to understand what works with a given audience is to test. The most traditional way of testing subject lines is A/B testing. Within the A/B testing methodology, there are multiple characteristics that can be tested. If you are testing the brand voice or positioning you can have more than two test segments. To perform a test it is important to make sure that only one variable is changing, in this case, the subject line. The content of the email must be the same. Some ESPs allow for a random audience split, others may need a manual upload of lists to corresponding versions. The recommended timeline is not set in stone. If time permits, you can wait 48 or 72 hours, but in most cases, opens after 24 hours are insignificant. We also have to make sure that we are looking at unique opens. If you are seeing lower than usual open rates for a particular campaign, that means the subject line was not strong or compelling enough to engage the reader. For us, it means that we made an incorrect assumption about customers’ needs or we simply didn’t incite their motivation or challenge their curiosity. Regardless of the cause, we must always put ourselves in readers’ shoes as we craft that subject line that will hook them. Mix things up, change your approach, don’t forget the preheader, and continuously test and optimize. We hope that your open rate improves. Good luck! Previous Previous post: Retail Apocalypse: Will Offline Shopping Become Extinct in the Next 10 Years?